Place the bread cubes into a lightly greased 2-quart shallow baking dish. Sprinkle the chocolate pieces over the bread cubes. Beat the milk, eggs, brown sugar and vanilla extract in a small bowl with a fork or whisk. Pour the milk mixture over the bread cubes. Stir and press the bread cubes into the milk mixture to coat. Bake for 40 minutes or until a knife inserted in the center comes out clean. Serve with the whipped cream, if desired. 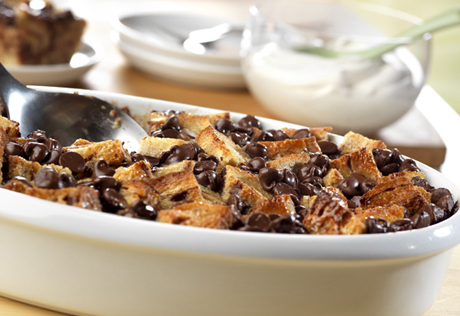 Tip: This bread pudding can be served with the whipped cream as a dessert, or with a sprinkle of confectioners' sugar as a decadent brunch dish.